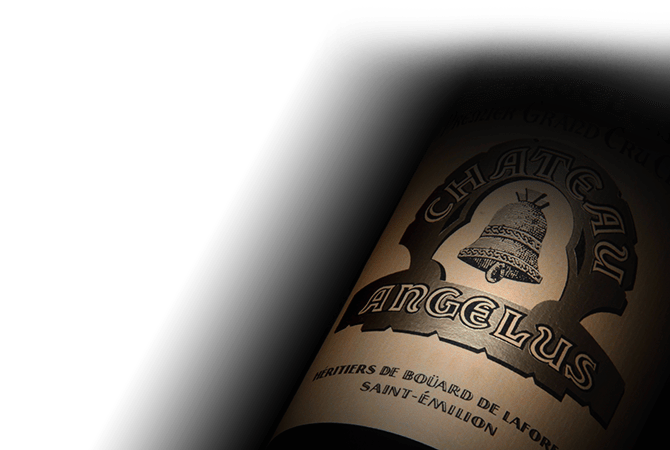 Chateau Angelus, a Saint Emilion Premier Grand Cru Classe A, was given its name because all three Angelus bells from the surrounding village churches can be heard ringing in the vineyards. Chateau Angelus has been in the de Bouard de Laforest family since 1782. Chateau Angelus is a vineyard that is in a south facing slope of Saint-Emilion. Water is drained naturally thanks to the slope. Limestone and clay provide the vines with the nutrients that they need to produce well-structured wines. The grapes are distributed on the land, based on the soil type. Cabernet Franc (47%) is on the sandy-clay limestone at the bottom of the hill and Merlot (50%) is on the hill. The last grape variety grown on the property is Cabernet Sauvignon (3%). The Cabernet Franc vines tend to reach their peak at the age of 20 years old. Due to their ideal location Angelus and its second wine, the Carillion of Angelus, are known to be a perfect expression of the marriage between Cabernet Franc and Merlot. A silky wine with a high level of ripeness, Angelus gives forth a surprising fresh character with its flavors dominated by flowers, red fruit, vanilla and liquorice.